Americas Cardroom OSS CUB3D With $4.5 Million GTD! That means Three Online Super Series running in a row…..MOSS, OSS and BOSS. Starting on August 14th and running through Sept. 11th. 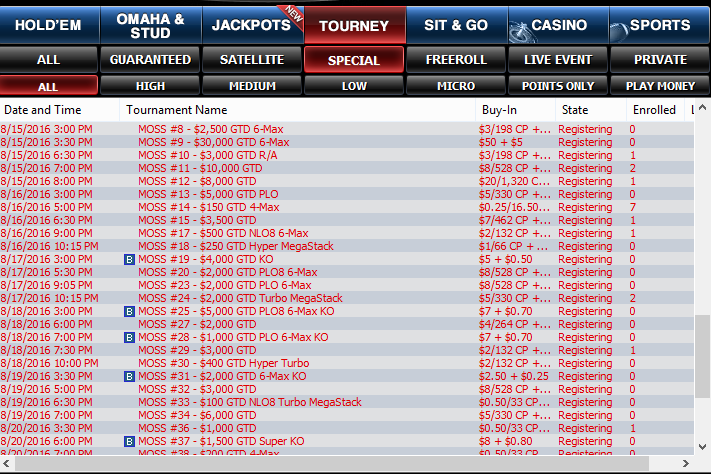 In total, there will be 141 OSSCUB3D events over the entire 25 day Series with $4.5M in Guaranteed prize pools. MOSS is the Mini Online Series version, with buy-ins starting at 6¢, 11¢, 28¢ and up to $88 for a $150K GTD. Most entries are in the $1.10 to $5.50 buy-in range. MOSS will run from August 14 to August 21st with 47 events planned. That’s an average of 6 per day. 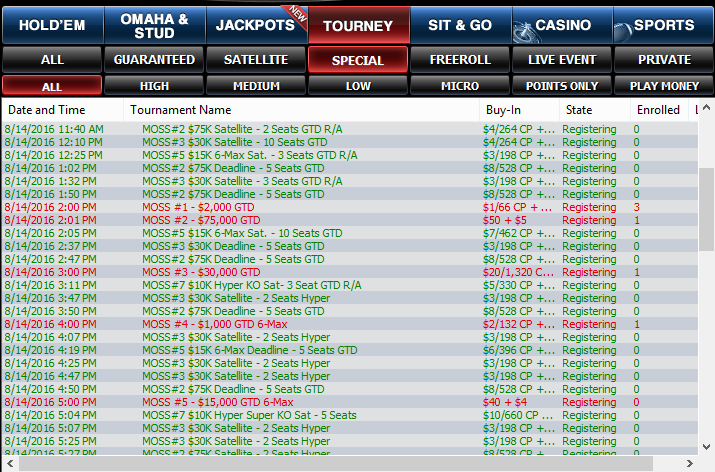 Top MOSS Events include: $11 / $12.5K, $22 / $40K, $55/$75K and the huge $88/$150K. MOSS Formats include: 6 max, Knock-outs, R/A’s, 4 max, NLO8, PLO, Mega stacks, Turbos and PLO8. MOSS Satellites are scheduled and the entire MOSS schedule is available now on the Special Tournament Tab. OSS will run from August 24th to Sept. 4th with buy-ins starting at $1.10, $2.20, $3.30 and higher. Most OSS events will be in the $11 buy-in range. In total there are 77 OSS events scheduled over 12 days with an average of 6 events daily. OSS Formats include: 6 max, Knock-outs, R/A’s, 4 max, NLO8, PLO, Mega Stacks, Turbos, Super Knock-outs and PLO8. The Main Event of OSS, The $540 buy-in, $1,000,000 GTD tournament on Sept. 4th starting at 4PM ET. BOSS is the Bigger Online Super Series. Running from Sept. 7th to Sept.11th, BOSS is the High Roller Leg. Tournament Buy-ins start at $109 and range up to $2100. There will also be a Special CAGE Match on Wednesday Sept 7th with a buy-in of $5100. In total, there will be 17 BOSS tournaments spread out over 5 days. Tournament Formats for BOSS will include: NLHE, PLO, PLO8, 6max, Super Knock-out and R/A tournaments. Tournament Guarantees include: $215/$40K, $150/$60K, several $100K’s, $215/ $200k and the main event which will be held on Sept 11th at 4PM ET with a $500K GTD with a $2100 buy-in. As always, ACR will set you up in style with a 100% up to $1000 Deposit Bonus, New Depositor Free Rolls and up to 20 days of free JackPot Poker play. 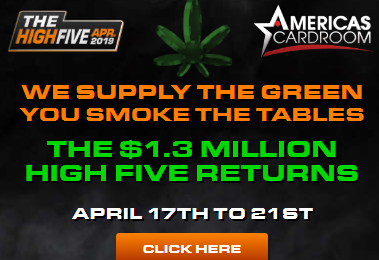 Check out ACR Today and get ready for the biggest Poker Tournament Series ever on Americas Cardroom.